I know that after I leave, savage wolves will come in among you and will not spare the flock. Even from your own number men will arise and distort the truth in order to draw away disciples after them. The apostle Paul clearly states that from among our own, men will distort the truth. McLaren, Emerging Church, offers an evangelical vision that emphasizes tolerance and social justice. He, McLaren, contends that people can follow Jesus’s way without becoming Christian, and argues that Christians should be more concerned about creating a just “Kingdom of God” on earth than about getting into heaven, and said that followers of Jesus might not be the only ones to gain salvation. “Watch out for false prophets. 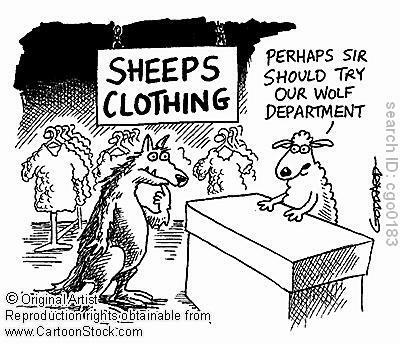 They come to you in sheep’s clothing, but inwardly they are ferocious wolves. By their fruit you will recognize them. “Not everyone who says to me, ‘Lord, Lord,’ will enter the kingdom of heaven, but only he who does the will of my Father who is in heaven. Many will say to me on that day, ‘Lord, Lord, did we not prophesy in your name, and in your name drive out demons and perform many miracles?’ Then I will tell them plainly, ‘I never knew you. Away from me, you evildoers! Each believer has the responsibility to strengthen other believers. This is especially true of those who shepherd the flock. Jesus died for the church. Christians must live to strengthen it. Dude! McClaren actually said that nonsense? And people wonder why we are supposedly so intolerant of this nonsensical “Emergent Church” garbage. Quotes taken staight from the famous Washington Compost (oops….Post)! This is an example of political correctness storming through the doors of the church. Trying to make Jesus comfortable for everyone. The hardest thing to swallow is that he (McClaren) is telling people they dont need Jesus to enter the Kingdom of God, and people are taking refuge in that message. I sure hope you are joking about changing my choice of brothers. I believe just as you cannot choose who your natural brothers/sisters are, you cannot choose who your spiritual brothers are. I love my brother, I stand with him, and hope you can respect that. ….Peace and Blessings to you and yours! God Bless! Of course, I am joking. Donald and I have a mutual respect for each other. I am sorry if my way of joking was offensive to you. Any friend of Donalds’, is a friend of mine. I was not offended. I can be very sarcastic, and joke around with the best of them all. My comment was meant to answer both questions with one answer. Donald speaks highly of you, so no worries, it’s all good, I get jokes! *sigh of relief* How good and pleasant it is indeed when brothers can dwell together in unity. Okay, enough of this chick-a-fied touchy-feely nonsense. Let’s get dangerous! There is no question that we live in very challenging times. The true church lives in persecution. Not the I’ll cut your head off kind of persecution, but the “truth” persecution. This is a devilish mental and spiritual poison that is being spewed around us. The Gospel has become a “this is all about you” message instead of the message of a Just and perfect God who has provided love through the cross of His son Jesus Christ. This is why hell is so threatening to even some Christians. The only way a person can really (and I mean really) understand God’s love is by really understanding hell and judgment of a perfect and just God. This is why I throw my hands up in the air and worship the king of kings. I am a brand plucked from the fire! That alone is praise worthy! Thank-you for your comment, you are always welcome here! Knowing that a brand is what would be heated up and then pressed against an animal to permanently mark them, what is it you are hoping to be pressed against to permanently mark? There’s a blog topic right there, hermano. ( I’m a brand….and here’s what mark I am leaving.) Hmmm. Has potential. Thanks for the comment, hope to see you around here more often.